Jaguar just recently released their new XKR-S at the 2011 Geneva Motor Show and we now have our first images of the new sports car out on the street. We think that this may even be at a Jaguar-Landrover dealer because, if you look closely, you can also see the new Range Rover Evoque in the background. Actually, there are a few shots of different Evoques with one being theHello Shanghai model provided by Landrover as part of their testing fleet. Anyway, here’s another chance to take a good hard look at the new XKR-S sports coupe designed entirely under the guidance of Design Director Ian Callum. 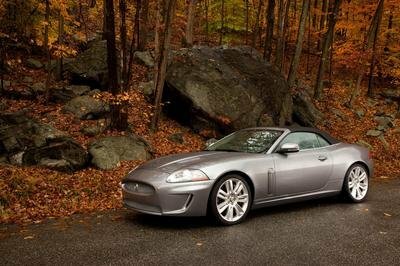 The new Jaguar XKR-S is powered by an AJ-V8 all-aluminum powerplant with twin-vortex Roots-type supercharger that delivers a total of 550 HP and 501 lb/ft of torque. This brilliant machine is the most powerful Jaguar road engine ever made. With this amount of power, the sports coupe will get to 60mph in 4.2 seconds and will go up to a top speed of 186 mph. Aerodynamics also helped out in the performance department. Jaguar added a new bumper design featuring near vertical feature lines running down from the edges of the oval air intake and supporting the new carbon-fiber splitter and lower spoiler. The rear gets a separate rear wing. Thanks for the pics, Hardie! Yeah, The car seems huge and I thought that the weight would affect the speed of the car bu i guess I was wrong. The aerodynamic is great and the performance is good! Wow! I was impressed with the aesthetic of this car. It somewhat looks like a muscle car and yet has an amazing figures! Yeah, i mistakenly identify this car as Range Rover Evoque! Anyways, XKR look amazing in that image, i think it look much prettier personally. And one thing, IMO, the front is kinda over designed though the headlights are aggressive. Well, I must admit that I am one of those folks who were a bit skeptical when I first saw the pictures of the XKR-S. But looking at these new ones, I would say that the car isn’t really that bad after all. Never really have that much love for the XKR-S, there isn’t really much new to it. But since this one is still a Jaguar, many people will probably be going for it.